A Chinese case manufacturer has created cases claimed to fit Apple's forthcoming iPod lineup, with a fourth-generation iPod touch shown with a rear camera and flash, and a small, square sixth-generation iPod nano. 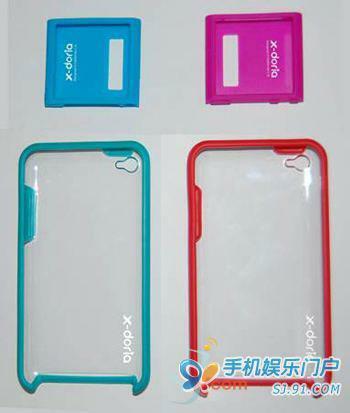 As spotted by iLounge, photos of the cases from X-Doria are claimed to fit Apple's next-generation iPod touch and iPod nano. They show what would be a major redesign for the iPod nano, giving it a small, square design that would perhaps be more akin to the iPod shuffle line. The purported iPod nano case includes bumps on the side that appear to correlate with volume buttons . It also has a space in the back that could allow for a clip. The size of the Chinese case has fueled speculation that a new device could employ the Apple-branded 3cm-by-3cm touchscreen that was discovered earlier this summer. Apple's current iPod nano has a display that measures diagonally 2.2 inches, or nearly 5.6 centimeters. The cases also support an earlier rumor that Apple could unveil a new, smaller iPod nano without a click wheel. One analyst said that the redesign would be a "big departure" from the current design, though he cautioned that such a device may not see the light of day. The iPod touch case shows space for both a camera and a flash on the back side. It also sports a curved back, suggesting the new device will not be flat like the glass back found on the iPhone 4. Numerous alleged parts from Apple's forthcoming iPod touch refresh have shown space for a forward facing camera, suggesting that the new device will support FaceTime video chat. Apple on Wednesday sent out invitations for a "special event" on Sept. 1 in San Francisco, Calif. The keynote will begin at 10 a.m. Pacific Time, 1 p.m. Eastern, and will be held at the Yerba Buena Center for the Arts. AppleInsider will have full live coverage.